I am going to describe a work of art of Banksy. 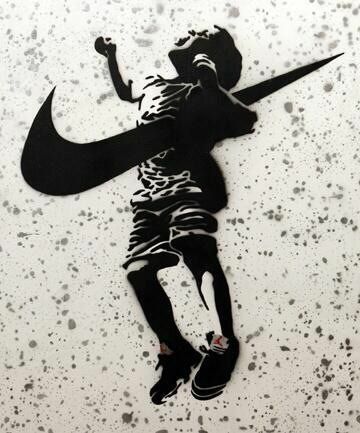 I can see a kid murdered by the logo Nike so maybe Banksy wants to show you how a popular logo can ruin kids, it might be because the logo can ruin kids because Nike’s clothes are so expensive or it might be because Nike uses kids to make Nike’s products (shoes, t-shirt, joggings,…).It’s maybe a message to stop buying popular logo’s products to kids because they are going to be addicted to these products. It maybe too a message to stop employing kids to make Nike’s products. I think this image is true and sad because they make kids go the wrong way or they employ them. Bilan de la rencontre avec le maire et du rendez-vous avec Demba de la Galerie Itinerrance. Le street Art est un vecteur d’ouverture culturel qui suit un mouvement pictural. Dans le 13e arrondissement, notre maire a choisi de mettre en avant ce concept il y a huit ans environ lorsque ce n’était pas encore connu. Il soutient le Street Art en faisant des démarches professionnelles ( peintre,graffiste…) et appelle ces artistes des quatres coins du monde pour qu’ils puissent partager leurs œuvres ici dans notre quartier. Le street art qui était au début une peinture très provocatric est maintenant tres populaire et attire la venue de nombreux touristes et artistes. Cela a des aventages mais aussi des désaventages comme le fait d’appeler un artiste car le prix dépend de leur localisation, les outils dont ils auront besoin et l’hotel. Pour le maire, ces œuvres préférées sont souvent les récentes d’ailleurs, il y a un nouveau projet préparé par Conore Arington qui se fait sur le boulevard Vincent Ariol. Cette position pourra à nouveau attirer l’œil d’autres personnes. The work of art was painted by Banksy. On the wall there are two soldiers, they wear weapons and in the middle we can see a symbol of peace. The soldier on the right he carries a bucket with a white brush. They erase the symbol of peace on the wall. Maybe Banksy wants to stop a war in the real life and he accuses the soldier to don’t stopping the wars. This stencil was made by Banksy in London, I can’t find the date. At the top, it reads « if you repeat a lie often enough, it becomes truth ». Just below it, we can see a young girl who has turned the word « truth » into « politics ». All of the graffiti is black , apart from the word politics which is in red. In England - as in France - a lot of people think that politicians are used to lie and to disonhour their pledges. Moreover, you must know the famous saying « Truth comes out from children’s mouth ». So this painting raises awareness even more because of the denounced truth through the child’s writing. I think Banksy wanted to denounce the fact that today, in our lifetime, every body is concerned about politics, even though children are too young, they also know about the political situation. 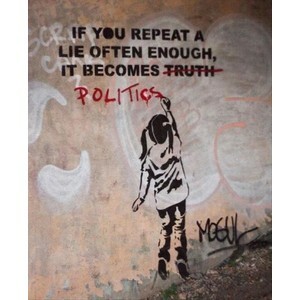 I like this work of art because it shows us what Banksy thinks about politics, he is not trying to be a hypocrit, but I’m not fond of it. 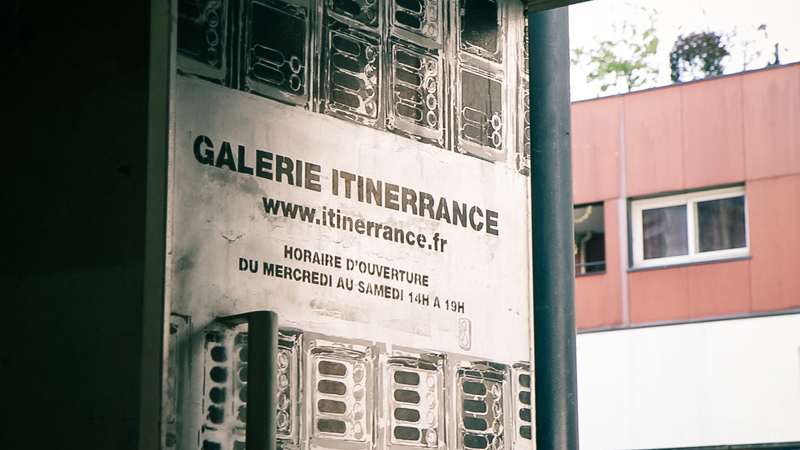 Le lundi 20 Mars 2017 nous avons rencontré un responsable de la galerie d’art Itinerances située dans le 13e arrondissement . Le responsable nous a dit qu’ils ont déjà fait venir des artistes de street art , mais ce sont les sponsors qui payent le voyage , logement , le matériel ( la peinture etc...) . Les artistes viennent parfois avec des personnes pour les aider à faire leurs œuvres , ils restent 15-20 jours et sont payés environ 2000 euros . Ils prennent entre 1 et 2 semaines pour faire leurs œuvres .